Main page "Colours ot the MiG-29 (Fulcrum)"
2008: 1 MiG-29UB crashed near Almaty during training flight, one pilot died. Former Kazakh Soviet Socialist Republic, independence in 1991. 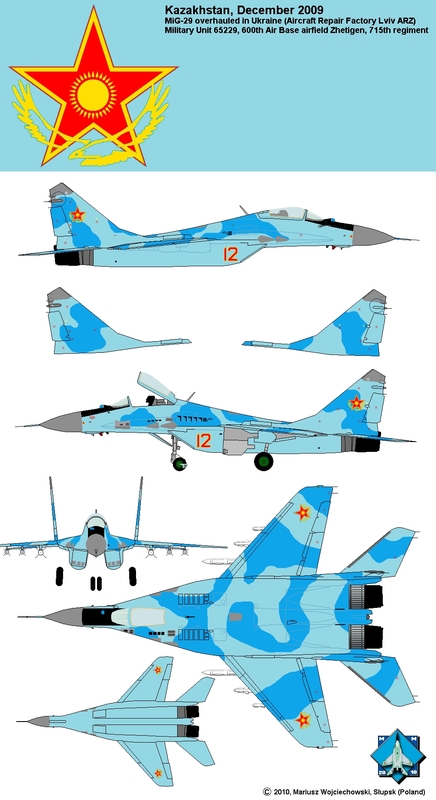 Kazakhstan obtained Su-27 and MiG-29 (40) from Russia as a form of payment for Russian debts, also for using by Russia the Baykonur space centre and for the Tu-95MS from Semipalatinsk air base returning to Russia. MiGs were delivered to Kazakhstan from Lugovaya air base in Kirgistan (715th Fighter Air Regiment) where they were stored for few years, since the end of the USSR. It was all 9-12 and 9-51 variants. Some of the 9-12 are very old - it's the aircraft from first production series! Aircraft were overhauled and repainted, probably in 1995 and about 2003. Since the end of 2009 MiGs are overhauled and repainted (new scheme) in Ukrainian Львівський Державний авіаційно-ремонтний завод "ЛДАРЗ" (Lviv State Air Repair Plant "LDARZ"). Maybe slightly modernized, equipped with satellite navigation system. First overhauled MiG-29 no. 12 and MiG-29UB no. 40. 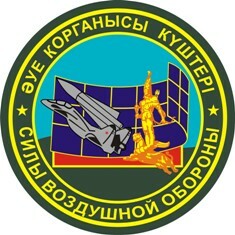 600th Air Base (Military Unit 65229, former 715th regiment) in Жетыген (Zhetygen near Almaty, former Russian Nikolayevka). In Zhetygen there's also 149th regiment equipped with Su-24. 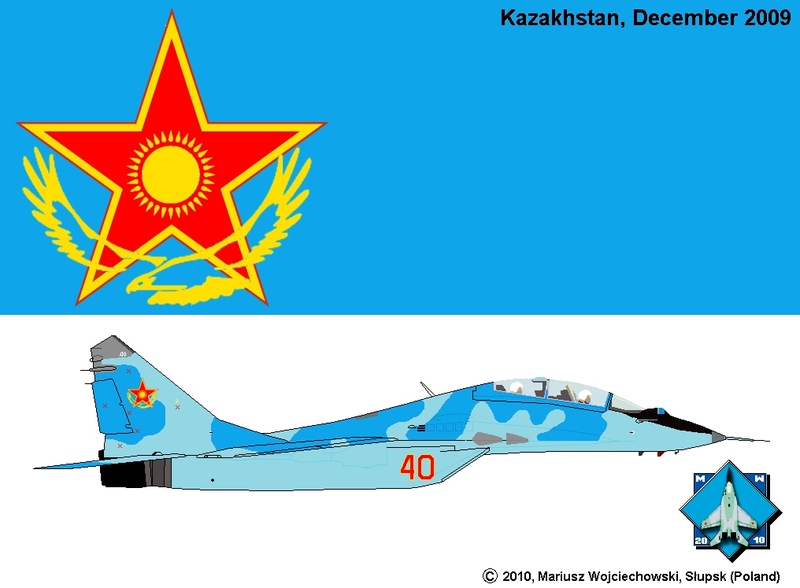 Other Kazakh air bases: 602nd Chimkent (Su-17, Su-25), 604th Taldykorgan (MiG-27, Su-27), 610th Sary-Arka airport, Karaganda (MiG-31). MiG-29 no. 04, Kazakhstan, 2003. MiG-29 (9.13) from early production series (only about 30 was built!) with different that standard anti-static conductor rods on rudders, dorsal fins and no chaff/flare dispensers. Each aircraft (also trainers) has a different pattern of camouflage. Drawing accuracy: shapes on upper surfaces are hipothetical. MiG-29 no. 12, Kazakhstan, December 2009. Overhauled and repainted in Lviv. First public appearance in KADEX-2010 defence exhibition, June 2010, Astana. Each overhauled aircraft has a different pattern of camouflage. Drawing accuracy: shapes on rear parts of the wings and between fins are hipothetical. MiG-29UB #40, Kazakhstan, December 2009. Overhauled and repainted in Lviv. 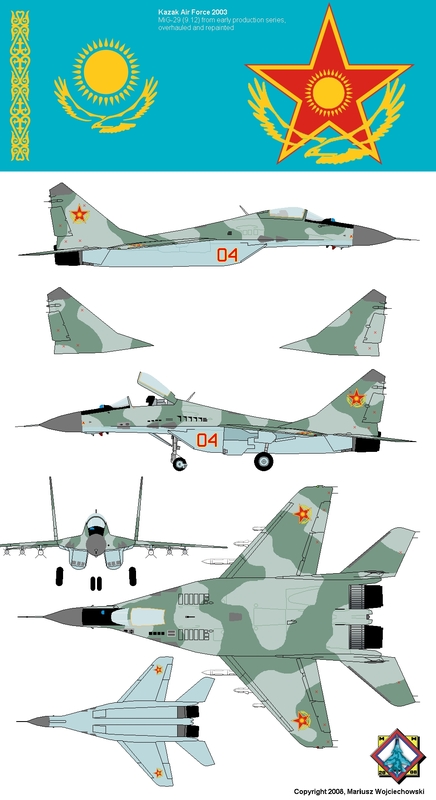 Drawing accuracy: OK.
Colours of the MiG-29 (МиГ-29).